I got a last minute invitation(thanks Steve!) 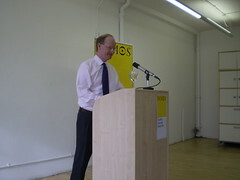 to go and hear David Willetts speak at Demos this lunchtime. Here are my lightly edited notes – apologies for poor grammar, any mangling of Mr Willett’s rhetoric or translation of his argument as it passed through my dastardly liberal brain. He spoke on what we owe future generations, asking what responsibility do we have? We are used to thinking of society divided by class or income, more recently seeing divisions by ethnic or national identity, but now we need to look at division between generations – a theme covered by today’s UNICEF report but also (Sir) Nick Stern’s report on climate change – which analyses from an economic standpoint the future for our children and grandchildren. I’d like to focus there first. It’s become a debate about economics rather than science. The scientific argument that climate is changing is over, clearly something significant is happening associated with human activity since the industrial revolution. The economics are more controversial – Stern asks what costs are we prepared to expend today that won’t be of benefit to us but to our children etc. He starts with the Social Discount Rate – how much a pound in a years time is worth to you now. ie £100 now vs £105 in a year is a rate of 5%. Instead of conventional rates, he sets a level of 0.1% so it’s roughly the same – if he’d gone for a much higher level then the benefits would appear tiny. so using such an exceptionally low rate these benefits loom very large. Willetts salutes the moral judgement Stern makes – but there is a second assumption – as the economy grows there will be more money we’ll be richer – but how much happiness does this bring? Stern says the utility yield should be the same – 1% of GDP should in psychological terms be equivalent to 1% of GDP in the future. This is where it gets tricky and where it needs to enter the political mainstream. We can make these assumptions separately, but combined they cause problems. If both assumptions hold, then such a society would be willing to engage in large amounts of saving – people would never say “don’t worry about the future” – one estimate is it implies savings accounting for around 31% of GDP. But that isn’t how we behave – so this implies that we don’t value the future in the same way as he says. It’s not just a move from science to economics it’s a political move as it represents a moral demand for different behaviour. Some commentators have suggested that perhaps we should see it as insurance – the costs aren’t too great to bear. But why should be pay a premium on behalf of future generations? to tackle that we have to recognise that we owe much to previous generations, that there is a generational contract. So we actually have a powerful argument for making provision for our grandchildren by looking back at what the Victorians left for us. UNICEF tells us we aren’t investing enough in our children – economists say we aren’t investing enough either – we have managed high growth from low investment, but the worry is that we aren’t investing enough in longer term stuff. Conventional analysis doesn’t differentiate between these types of investment. We’re not good at low pulse, low return investment such as building sewers or railways. So, the most important thing is that we are not doing enough for those coming after us. Climate change, housing prices, pension crisis and educational standards are examples of how we have a responsibility for keeping things for ourselves. An important connection between these arguments – it’s still important for us to live in the now, not just for future generations. As individuals and as society as a whole, we’ve found it more and more difficult to delay gratification – this represents a weakening of our ability to commit to the future. Childhood obesity, personal borrowing are both about the difficulty of resisting the appetites of today. It’s “Because I’m worth it” vs “Because they’re worth it” – the danger is that we live for the present rather than the future. All the present Government wants is immediate results – long term projects are only seen to succeed if they have quick outcomes. The Conservatives under Cameron have talked about Social Responsibility – trusting professionals more because they have inner standards, underlying principles – the question is, what are these for politicians – are there any? What enables us to distinguish between bad and great leaders – Willetts believes it is seeing the contract across the generations, making provision for the long term, wanting to leave a legacy. On a personal individual level this is very hard and the onus falls greatly on women. Much less inter-generational working in business and in communities especially the creation of age-related ghettoes. learning is a lot easier when you mix up the ages, increase the diversity. q: More need ot think about the social nature of a contract – enabling children to understand their part of the bargain, by understanding their responsibilities which they gain from staying in their communities and being socially engaged. a: I worry that it’s a flat world for children – it appears that cognitive and social development is delayed by this – I would encourage anything that enriches their social lives and gives them the chance to experience the world around them. “toxic childhood” vs “everything bad is good for you”. 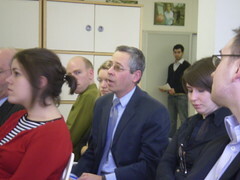 q: role of arts in education particularly in primary school – i’m concerned by utilitarian approach. a: story of the sorceror’s apprentice – teachers on a treadmill teaching to the test so that the wider experience is sacrificed. so schools should not be measured on gcse results alone – give teachers more freedom and release some prescription. teachers need the freedom to give space to kids. so we’re looking at how to cut back the levels of central prescription. q: How can we support younger generations given demographic issues of an aging population. a: The sweet spot is now – a large proportion of people of working age. We will have a different ratio in the future. My argument is that if we don’t do enough – what debt will our children feel they owe us? q: Child poverty report – the bbc response was that this was a symptom of an overly competitive society. I prefer the analysis that it’s about delayed gratification. We have failed to provide the younger generation with a proper framework to move ahead. a: Teenagers and people in their 20s have quite conventional longterm aspirations – get married stick with hold down a job. what is harder is to link what you need to do today to achieving those aspirations so it becomes a distant mirage that is disconnected from your own life – so we’ve taken away the intermediate steps – a framework in schooling where people can see how they make progress – or speedy justice to deal with impetuous criminals. q: What can we do about the short-termism of the market? q: How do you get an equal system? a: Generational difference is overwhelmed by class or income. Raising standards in our schools has to be the most important. The City Academies stuff is good here – it shouldn’t be about admissions but about increasing the number of good schools and this can be done best by giving freedom. q: A feature of a contract is negotiation – but here we have to play both sides – what challenges does this present. a: Yes, we are trying to reflect the interest of those very young or unborn. This is the contribution of Stern, providing an economic framework to help us see more clearly, so more stark analyses. The trouble is, we exaggerate what politicians can do in the short term, but underestimate what can be done in th elong term. q: We are still looking at national units, so much of what faces us are international but we fail to connect this with the issue of space and boundaries. a: I think the nation state is still a powerful device to enforce contract across the generations defining boundaries so that we can understand better. the family, where this happens informally, can’t handle it alone. global forums can’t prescribe. so the nation state is a good middle place – quite well suited. a: David Cameron was in Sweden last week. One of the things I learned from sweden is that you can have much more diversity of provision in services. It also has a large amount of investment in childcare – which is right, but we’ve done here is to take what was a good network of private & voluntary provision and made it state-provided. I would like to learn better from the Swedes. We should not to be afraid of making judgements about what’s the right thing to do for young people. All you can fall back on is health & safety – this is a bad sign – so we welcome things like Jamie Oliver saying this is what kids should do, this is what they are entitled to expect from us. Afterwards I caught up with Catherine Fieschi, Director of Demos to see what she thought of the session.